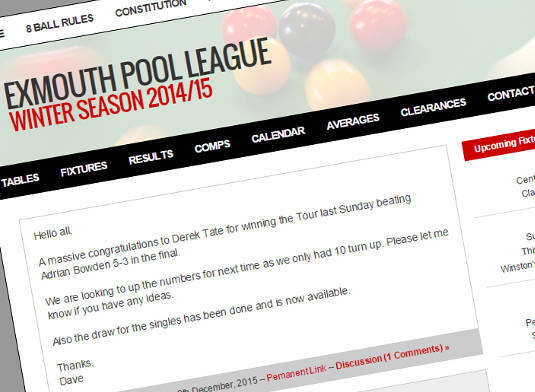 I am delighted to have worked with the Exmouth Pool League on a complete redesign and rebuild of their website. The league needed a way to add fixture lists, league tables, player averages and new updates on a weekly basis. The whole website is custom built from the ground up to accommodate exactly what they needed, plus much more, and it is now the central form of communication for the league and the teams. The website is also mobile responsive, allowing players to check up on the rules, look at their next competition opponents and get updates whilst out playing pool in an evening.